Synthetic grass in Hawaii?? You bet! Hawaii's diverse weather with very wet windward sides and dry leeward sides makes growing grass a challenge at times. Our big trees don't always allow enough sun to grow a thriving yard. Who's got the time to maintain a beautiful landscaped yard anyway? Don't you just want to enjoy it? How much time do you spend maintaining your yard? 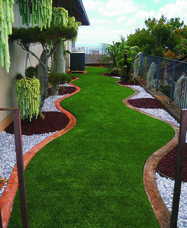 Artificial turf has come a long way since Astroturf. 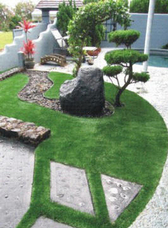 You've probably looked right at a Synthetic turf lawn and not even realized it was fake grass! Let local company, NyLawn and you, design a yard you can enjoy for years. We can incorporate existing landscaping or re-design your whole yard. Why not add a putting green? Got Pets? NyLawn is safe for pets of all kinds and sizes. It's easy to clean, pest and odor free. 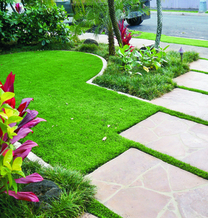 This Kaneohe synthetic grass front lawn includes beautiful landscape features with a faux stream and bridge with accents of solar lighting. 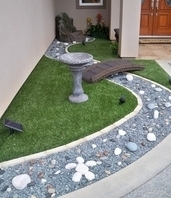 Artificial grass turf can make life easier in rock gardens like this. Before it was hard to maintain around each rock. Now with fake grass it always looks beautiful. an area where kids love to play! Hills can be hard to maintain and mow and that was true for this Mariner's Ridge front lawn. 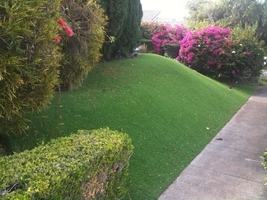 With NyLawn's professional installation of synthetic turf, this hill always looks great! Narrow back yards can be hard to maintain, and grass usually has a hard time growing because of shade from neighboring houses. With NyLawn's design and professional installation, this is now a landscaped backyard with synthetic lawn that anyone would be proud to own. Natural grass around a pool can be hard to maintain. Kids splashing cause excess water in the over saturated grass and creates slippery mud pits with dirty foot prints. 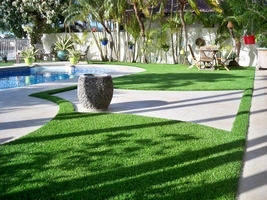 NyLawn's artificial grass with a good drainage design can keep your pool area mud and foot print free. areas creates a lawn that's always ready to enjoy and impress your guests! Mowed grass gets blown and tracked into pools by kids running around and jumping in the pool causing more work for you to keep the pool clean. NyLawn's turf grass will help keep your pool debris free and always looking great! 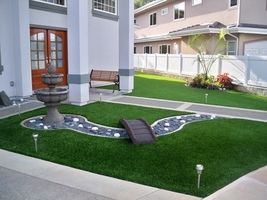 NyLawn's artificial lawn is safe, kid friendly and allergy free. 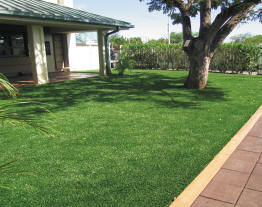 More and more Day Care's, Pre Schools and Early Learning Centers are turning to artificial grass. Our synthetic grass for play grounds is soft, locks in the dirt and germs, and provides a clean, soft surface to roll and fall on. No more sandy, dirty, kids with scraped knees! Kid-safe because there is no need for pesticides or other harmful chemicals. 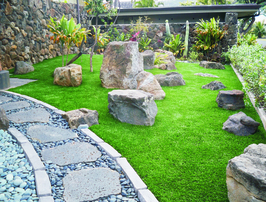 The Sheraton Waikiki Rum Fire used NyLawn's fake grass synthetic turf for their outdoor lounge giving the area a natural, tropical feel and look. This common area on Kaiholo Street in Campbell Industrial Park, is 6000 sq ft, quite impressive and no maintenance! NyLawn has alot of experience contouring our artificial turf around many tree roots so they do not have to be disturbed.